Churchill is a great Heavy Tank within World of Tanks. Its armor allows a warrior to fight to a finish, provided good tactics and shooting skills. The history of this tank is very impressive, as Churchills proved to be good combat vehicles and did well during the battles, saving many tankers' lives. "Combat vehicles stormed German positions; four of them were hit and one came back to base. The crews did not leave the tanks, and March 22-25 they continued shooting the tanks from their place. Every night, 50th Tank Regiment crews brought food and ammunition for those tankers. And in three days the Churchills destroyed an artillery battery, four bunkers, ammunition depot and up to two infantry platoons. The Germans suggested the crews to surrender several times, but the Churchill crews responded with fire." 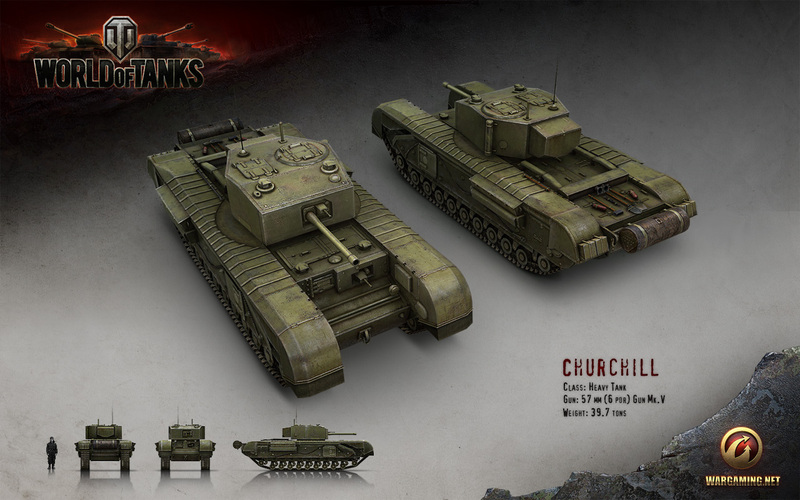 View Churchill renders and feel this tank's power!